1. Dotty Dresden. 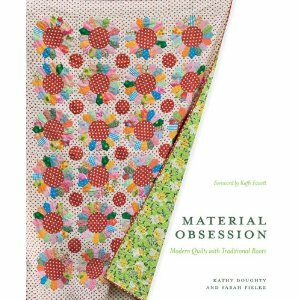 As seen on the cover of Material Obsession. 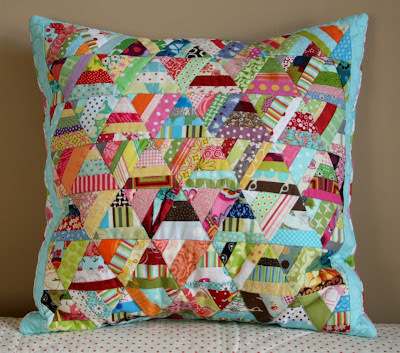 There is so much to love about this quilt! 2. Double Wedding Ring. It's a classic and I'd love to try my hand at it, but it scares me to no end! I think that's a sure sign that I should just jump right in and start it. 3. Tiny 9 patch. As seen in the Feb. 2008 issue of American Patchwork and Quilting magazine. I'd love to make it huge! Like full or queen size. In the quilt shown, each of the little 9 patches finish at 2.25"! 5. English Paper Pieced Stars. I've got a good start, just need to see it to completion. So, what's on YOUR quilty bucket list? I'd love to know! I've been home from the Colorado quilt retreat for 2 weeks already! I don't know where the time went...I think I blinked. Just a few of the many wonderful goodies from the gift bags...made by Tara. I remember reading a post awhile back by Cherri House about teaching and she said that she learned so much from her students. I had that same exact experience! I learned a TON and came home so inspired! (I can only hope that everyone else left feeling the same way.) Everyone brought such great ideas to the table. I was astounded. Not to mention all the gorgeous fabric combinations there were to drool over. Seriously, I was on overload! We had running little game throughout the weekend called "name that fabric". There is a very specific audience that would appreciate that game, and we were it! Let me tell you, Randi knows her fabric! herringbone quilting inspired by Latifah's amazing quilt. ﻿﻿During the weekend I somehow committed to quilting each of the 24 blocks in my second quilt with different designs than I used for the 20 in my first quilt. Maybe I really AM crazy?! Or maybe it does get easier to come up with quilting ideas the more you work at it? I hope that the latter is true! We had a scrap exchange as part of the weekend. Everyone that wanted to participate could bring a bag full of scraps, dump them in a community basket and then take what you want in return. I could regularly be found hanging out at the scrap basket. No surprise there. I may have been teased about it a time or two or three. But in my defense, no one else would have wanted the tiny pieces that I was rescuing. I pieced a bunch of scraps together for more of these blocks. I was so happy to see new-to-me scraps. Mine had been worked over and then some! We also had a mini quilt exchange. and came home with a log cabin quilt, made by my friend Mama Urchin. It happily hangs in my craft room right beneath my thread shelf so I can see it whenever I'm sewing. I just love it! Thanks, Jen! I came home with loads of new fabric, thanks to some generous friends. And a new Chik-fil-a cup. A reusable Chik-fil-a cup. (I'm still trying to live down drinking out of the same styrofoam cup all weekend long two years ago!) Several people were involved in the acquiring of said cup, which makes me grin. A lot. I love it and I use it all the time. Thanks Michelle! I'd like to thank everyone of the women who attended the weekend: Julie, Rebecca, Emily, Ruth, Randi, Amanda, Penny, Jennifer, Meloddee, Audrey, Carmen and Darla. A huge thank you to Tara and Lizzy for feeding us so well, and for making it such a memorable weekend. I sure appreciate all the hard work it takes to make it happen! I keep smiling when I think about the weekend. I'm so grateful for the opportunity to be a part of it. And I'm super excited that Tara and I have already started to plan for next year....I can hardly wait! While the turkey was in the oven yesterday I managed to finish up my Merry Minis quilt. Yay! I picked out this awesome backing fabric from the clearance section at Connecting Threads. I think the little sketchy print is absolutely charming and it really compliments the quilt top. It doesn't hurt that it's a lovely shade of blue/turquoise/aqua, either. When I get to the quilting point I usually tend to want to rush through just to get it done. I made myself slow down and do it right. I'm so glad I took the extra time-the quilting is one of my favorite parts! I quilted little loops all over in light aqua thread. It reminds me of swirling wind. The binding is a sweet stripe from the Children at Play line. It kind of reminds me of those old fashioned candy sticks. I love a striped binding! I feel like all the components of this quilt work together so well. I'm happy to have this one off the list and on to the couch. The timing is perfect! The quilt measures 55" x 66". How about you? Do you have a finish to link up this week? If you do, I'd love to have you play along. Please leave a link to a specific post and join in the fun. Since I'm posting so late today, I'll keep the linky thing open into Saturday. Happy Friday to you! I put the binding on this quilt the other day (week?) and I machine bound it. I thought ahead enough to snap a few photos along the way so I could share my process. Sorry if the photos of the process are less than stellar, I did it late in the evening, long after daylight had gone. I hope this gets the point across anyway. A little disclaimer...I'm by no means an expert on this subject...my first "big" quilt bound by machine was back in March of this year, so I'm still almost a rookie. But, I looked back at that binding this weekend and I have learned a thing or two since that quilt. Hurray for progress! Make the binding. Cut strips 2.5" wide from selvage to selvage, not on the bias. Join as many strips as needed, mitering the seams as you go. Make the binding strip long enough to go around the perimeter of your quilt. Take your quilted quilt and trim off the excess batting and backing so all the edges are even with the quilt top. Attach the binding "as usual" (you can read my indepth tutorial here) with a 1/4" seam allowance, except attach it with your machine on the back of the quilt, rather than the front. To finish it off, join the ends together with a mitered seam, just as you would if you were binding a quilt "normally". Now that the binding is fully attached to the back, here comes the fun part! Flip your quilt over and pick a point to start from. I start about 12" down from the top right corner. Here's the kicker...I don't pin a bit! In my first attempt I tried to, but I hated it. I got better results from just folding over the binding as I went. I was delighted to find this out! It sure beats getting pricked 1000 times during the top stitching process. Keep going in this fashion until you are close to the corner. At this point stop stitching, adjust the corner so it's mitered nicely, holding it in place with your hand and stitch slowly until you catch the corner point. Stop, pivot the quilt and keep top stitching. It's really that easy! Continue until you make your way all the way around the quilt. When you get to the point that you started at, back stitch a bit to secure the stitches and you are done! Start with mini quilts...or place mats. It does take practice, but it gets easier with time. On my first big quilt attempt, I did it on a low stakes quilt. Meaning, it is a quilt that was going to live at my house anyway, so there wasn't the pressure of getting it perfect on the first shot. My 8 year old doesn't care that the stitching lines aren't straight. I don't machine bind every quilt. If the thread color won't blend with the binding AND the back, I will bind it in the traditional way, with the hand stitching on the back. The binding shown on the back is significantly skinnier than on the front. Consider this if you are thinking of machine binding a quilt that has a lot of points. The wider binding strip on the front will chop off your points. But on a quilt like this, with a solid border it's a non-issue. This is just something that I consider. When top stitching, try not to go off the edge of the binding. If you do, just stop, go back a few stitches so they overlap (to secure that spot) and keep going. The goal is to keep the edge tacked down, all the while doing it with a consistent seam allowance, and keeping the back line of stitching from showing on the back binding part. Doesn't sound scary at all, huh? It's really not so bad, trust me! I'd like to give a big shout out to the lovely Anita for posting her lovely tutorial on machine binding awhile back. That is the first time I thought "I just might be able to do this!" Then I tried it six months later. :) I ended up doing a few things differently, but it gave me the pointers that I needed and more importantly the hope that I could do it. Thanks Anita! If you are one of those people who have always wanted to try machine binding but have been afraid to attempt it, I hope this gives you the nudge to jump in and try it. You might be glad you did! after reading the comments, (thanks for the tips you shared!) I've done a little more experimenting with my machine binding. The issue of the front of the binding appearing so much wider than the binding on the back started to bother me. I tested out this little change and it helps a lot! When trimming, I left 1/8" of the backing/batting beyond the quilt top's edge, rather than trimming all the layers even with the edge of the quilt top. Then I proceeded to finish the binding as directed above. but there was still plenty of room to fold over the binding and do the stitching without getting too close to the edge of the binding on the back. This is a view of the back. The binding is nice and full but still plenty of room for stitching. It's amazing how much that little 1/8" changes things! Welcome to week 4 of finish it up Friday! I hope you all have been busy finishing. I know I've been plugging away and it's so fun to celebrate the finishes (big and small) before going to the next item on the list. I'm still trying to figure out why on earth my list is so long? How about you? Do you have a finish from the past week to link up? If you do, I'd love to have you play along. Please link to a specific post and then go ahead and visit a few other finishes so we can all cheer each other on! Happy Friday! ...my little blog break. I was dealing with a massive case of inspiration overload. Such a terrible problem to have, huh? I was unable to shut my mind off for days at a time and it was wearing me out! The break was just what I needed and I have gained a little perspective, I think. :) I'm so happy to be back! ...those of you who checked in on me during that time. You guys are so sweet! ...my heavily creamed cup of coffee this morning. Mmmm. ...my little family. They are all so wonderful! ...an awesome quilt retreat this past weekend. I feel so blessed to be able to quilt as one of my "jobs". ...my amazing friends that are so supportive of me. ...sunshine and a decent run in the crisp air this morning. ...good music on my ipod and a little quilting time to go with it. like a merry go round.